Let’s crack a simple game. If you are not familiar with Radare, read Part I first. 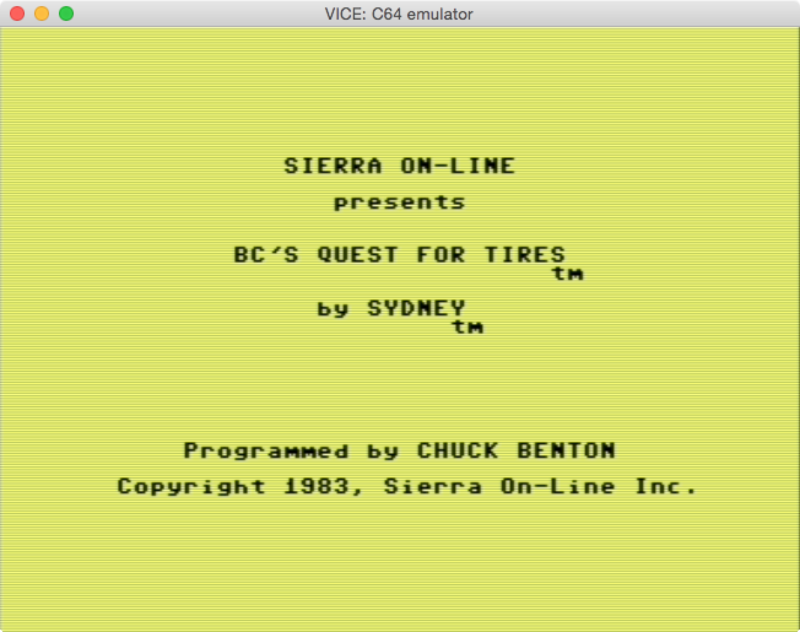 Let’s crack BC’s Quest For Tires since its copy-protection is easy to bypass. 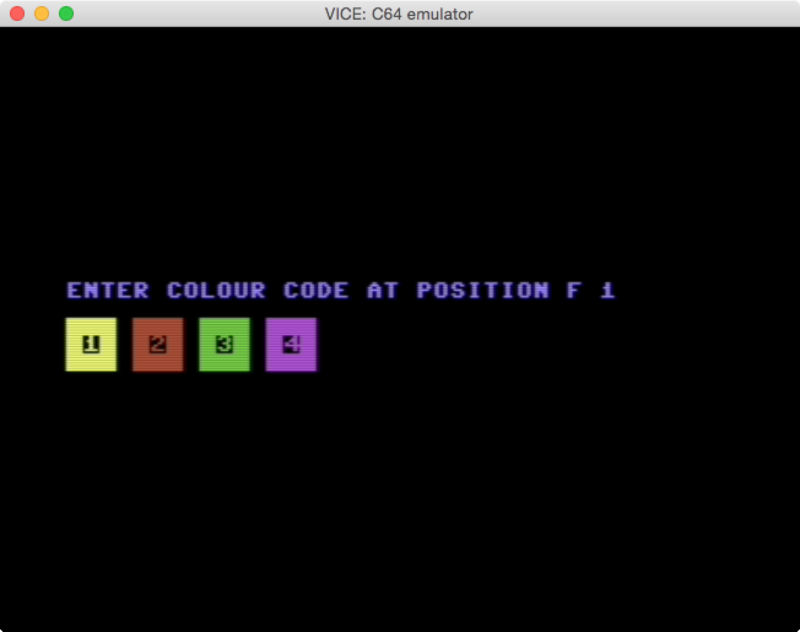 Open the tap file with VICE (the most popular Commodore 64 emulator), and..
…the game has some kind of copy-protection. If we enter invalid codes, we won’t be able to play the game. Since Radare supports VICE Snapshot File format, we can save an snapshot of the game, and analyze it with Radare. 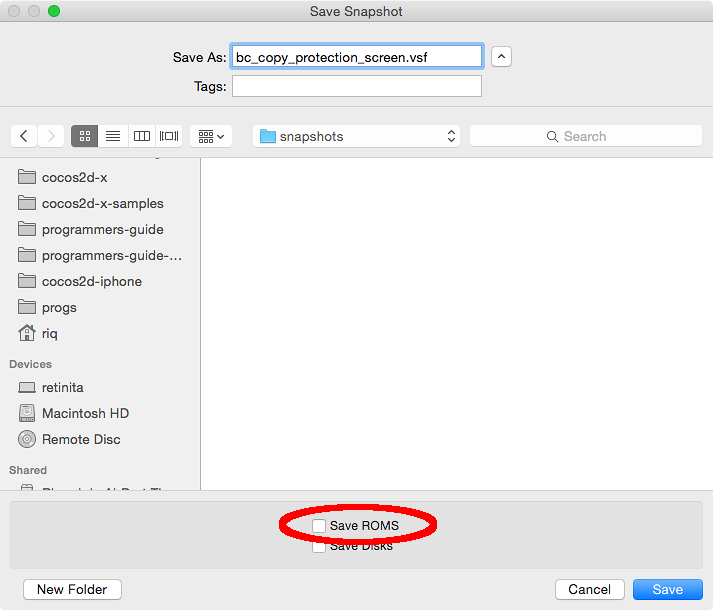 If we select “Save ROMs”, then the BASIC ROM and the KERNAL ROM will be saved inside the Snapshot file, and will be included as Radare sections. The BASIC and KERNAL ROMs in case they were saved. 0x00005689 is the PC (program counter) at the moment the snapshot was saved. 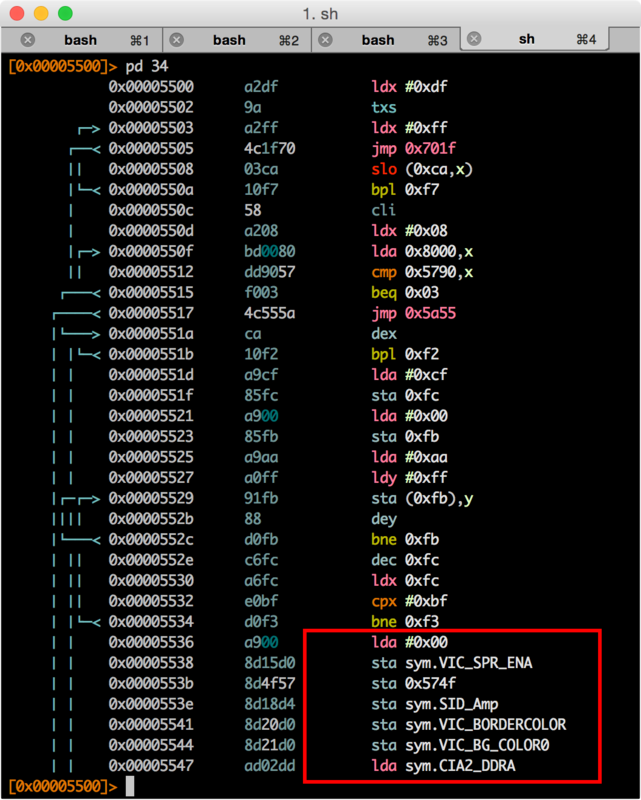 With the command S we can inspect the Sections of the VSF file. With S=, we see the sections in a more visual way. Actually we are not interested in disassembling the KERNAL at this moment, but we should know it is possible to do it. In case we want to disassemble the memory RAM that is beneath the KERNAL and/or BASIC we should remove the KERNAL and/or BASIC sections. We can add them again if needed. Remember that by appending ? to any command, we can get help. In this case, S? will display the help for the S command. We can also grep for certain symbols. Let’s say that we want to know what are the CIA symbols. Almost every command in Radare supports the ~ suffix which basically sends the output to grep (like pipes in Unix). And just remember that by appending ?, we can see the help for the f command, in this case: f?. So, after analyzing the boot code for a while we will realize that the 0x6000 looks suspicious, and it could be the address that we are looking for. So, let’s figure out is who calling 0x6000. Radare has many built-in variables that can be changed with the e command. To display all the available variables, just type e. You can grep certain variables by using the ~ suffix. The default option for search.in is file, which works Ok for us. But in some advance cases we might want to switch to either io.sections or io.section. More on this in future posts. x: To open the “Goto xrefs” menu. It will appear at the top-left corner. Only available when we see a XREF legend above a function. Use 0-9 to jump to the displayed xrefs. 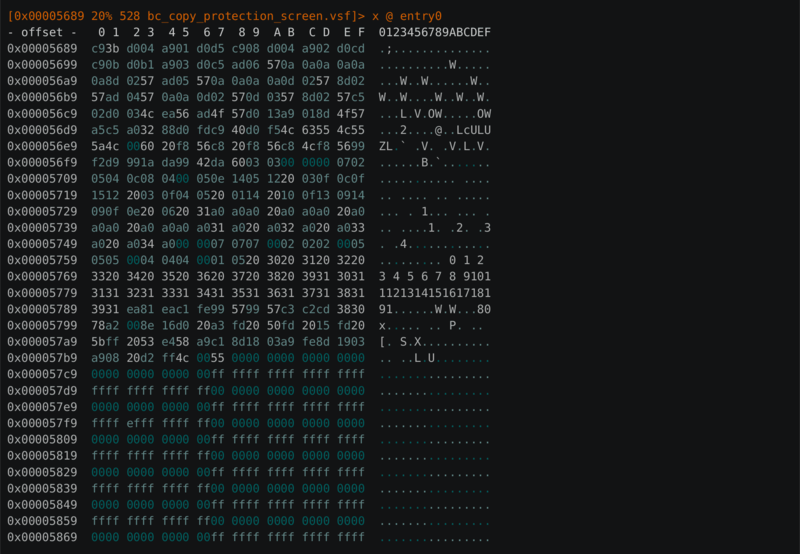 One quick way to cheat the copy-protection is by replacing the bne 0x03 with two nops. So, we have just patched the VSF file. If you load it from VICE, the game will be patched and we will be able to play the game, even if we enter invalid color codes. In order to save VSF files for C128, use a recent VICE version from SVN. VSF files are not meant to be “distributable” files. If you want to release a “crack” you should create .D64 or .PRG files. It is possible to create them from VSF files. More on this on future posts. argh… r2 changes the commands a bit. You’ll have to read r2 docs and see how it is done it the new version. sorry, don’t now the answer. I think the vsf plugin is somewhat broken. Entry0 is always 0x00000000 and the VSF seems not mapped properly. There are no sections (iS) either. At start it says: WARNING: Plugin vsf should implement load_buffer method instead of load_bytes. the radare internals changed a bit since I wrote the article… and not sure which are the new commands.